These are samples of what people have created using Proposal Kit. 200 samples with 2000 pages of content are included. 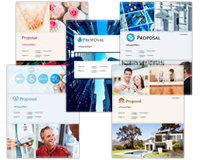 Create an unlimited variety of custom proposals using these samples. All samples are included in both PDF format and editable Word format. Word format versions of the samples can also be customized using the Wizard software. Sample Proposals are completely written sample business proposals, business plans, RFPs and other business proposal templates designed to assist you in writing your own. Easy-to-follow samples range in length from 4 to over 80 pages. The sample proposals were created using Proposal Pack. All of these Sample Proposals are included in Proposal Pack and Proposal Kit Professional. They are used to illustrate some of the unlimited types of proposals that can be created. The various Proposal Packs include both sample proposals and the original editable templates used to create the sample proposals. Use them to create your own unique business proposals. In addition to the hundreds of completed samples the Proposal Pack Wizard software includes hundreds of additional ready-made layouts to generate many more documents from lists already used by other companies for their proposals and business documents. There are 200 sample proposals included in Proposal Pack. This extensive library of samples illustrates the versatility of Proposal Pack, which allows you to create any kind of proposal for any situation. These samples are illustrations of the unlimited types of proposals you can write with your Proposal Pack. These samples are included as illustrations of how potential users might write their own custom proposals, just as you will be able to do. Sample Proposals include examples of finished proposals that were created using Proposal Pack. Samples illustrate how proposals have been created using various Proposal Pack logo designs. The samples include proposals from nearly every type of organization, both for-profit and nonprofit. You can find examples that run the gamut: we've included all sorts in there, everything from sample applications for government grants to sales proposals for environmental cleanup services to book proposals and research studies.